Thévenin’s and Norton’s theorems can be used to analyze complex circuits by focusing on the source and load circuits. One application of Thévenin’s and Norton’s theorems is to calculate the maximum power for a load circuit. The power p coming from the source circuit to be delivered to the load depends on both the current i flowing through the load circuit and the voltage v across the load circuit at the interface between the two circuits. So what’s the maximum power punch delivered for a given load resistance? Using either the Thévenin or Norton approach allows you to find the maximum power delivered to the load circuit. To see how to determine the maximum power, look at the resistor arrangements for both the source and load circuits in this sample circuit. 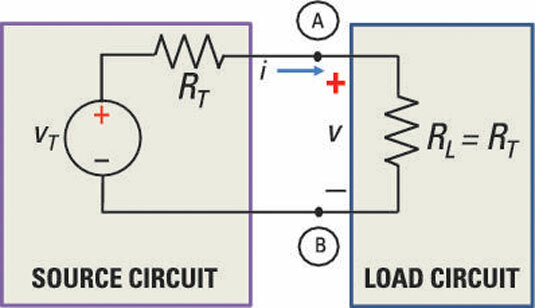 In this figure, the source circuit is the Thévenin equivalent, and the load resistor is a simple but adjustable resistor. Intuitively, you know that maximum power is delivered when both the current and voltage are maximized at the interface Terminals A and B. This equation equals zero when the numerator is zero. This occurs when RL = RT. Therefore, maximum power occurs when the source and load resistances are equal or matched.